When we think “roast” we often think “oven” but one of the tastiest roast meals is pot roast beef which can be done simply and easily on the stove top. 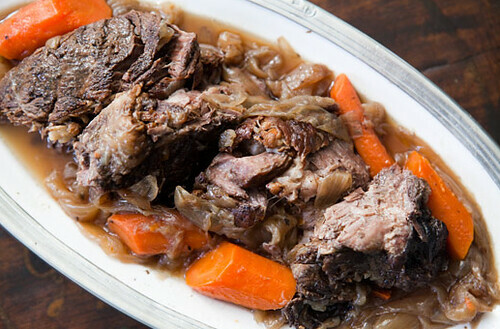 Pot Roast is an excellent meal to serve for an evening entertaining friends for a dinner party. It can be served with baked potatoes and gravy and a side salad of lettuce and tomatoes. The ingredients required are 2 teaspoons olive oil, 4 pounds boneless chuck roast,1 onion, chopped, 2 cloves garlic, minced, 2 bay leaves, 1 teaspoon salt, and 1/2 teaspoon freshly ground black pepper. Meat should be seasoned and left to marinade prior to cooking. First preheat an oven to 325 degrees F. Heat a Dutch oven on top of the stove over a medium high heat. Then add meat and sear for around 4 minutes, searing all sides for 3 to 4 minutes each. Remove from the pan and sprinkle salt and pepper, add garlic, and 1 bay leaf. Replace meat in the pan and cook in the oven for 30 minutes. Reduce heat and cook for a further 1 ½ hours. Garnish with onions and gravy. A variation on this dish involves searing the meat. Once browned, add water, and boil until tender over a low flame.